Somehow I had missed this well on my previous visits to Minard Castle, so on this trip I made a note not to forget St John's Well. 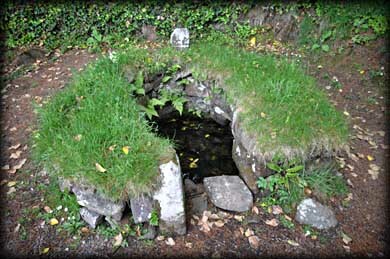 It is a dry-stone built well with a small cross inscribed stone standing at the rear while a stone marked with a cross scratched by pilgrims lies toward the front of the well. Pilgrims would flock to the well on Pattern day the 29th of August. They would circle the well while saying decades of the rosary. 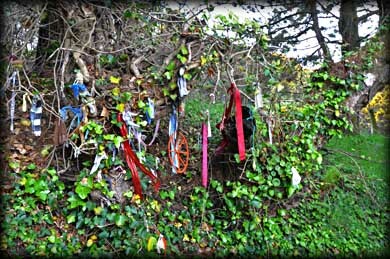 Traditionally the pilgrims would take a blackberry from the nearby bushes and throw it in the well during their rounds. The area around Minard is stunning so I recommend you take the time to visit the storm beach and castle, and maybe save a little time to visit this beautifully maintained well. 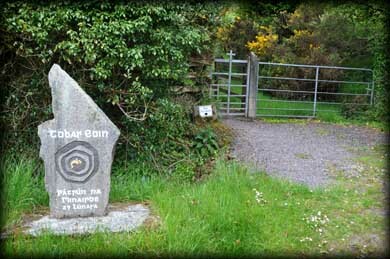 Situated: From Dingle take the N86 east for approx 8 kilometres to Lispole. 2 kilometres after Lispole take a right turn to Minard. 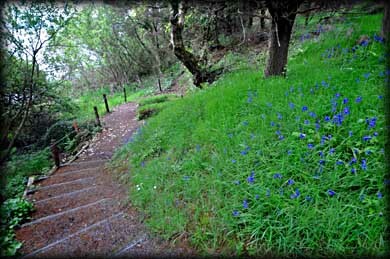 Walk 100 metres up the road to the right of Minard Castle, signed cul-de-sac. Discovery Map 70: V 5538 9914. Last visit May 2013.